Many of you asked for updates on how the craft room is coming along. While I didn't make MUCH progress this week. I'm quite excited about the few small improvements I can already see. Let me say, that at this point in the scheme, I'm working mostly to get rid of or just remove items from the craft room and reorganize the ones staying. There's not a whole lot of re-design going on just yet. However, I have begun to consider a color scheme. I'll get to that in another post. That bookcase was overwhelmed with stuff (here's last week's post for a reminder.) I've boxed up a bunch of the books (mostly ones on organization. . .HA!) to donate and moved some others to the bookcase in the living room. The Mickeys also got moved to the bedroom. 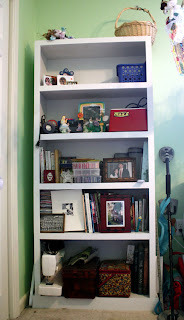 [For now, they're just in a box until I can get Pat to pull out a bookcase from the garage and put it in the bedroom.] In addition, moving books into the living room meant that I ended up having to go through all of the books in there as well. As a result, the thrift store will be getting TWO boxes of books from me!! All the books and magazines that did stay on this bookcase are pretty much craft related. To replace all of the stuff that was on there, I moved a bunch of my "sewing supplies" from under the window to this unit. On the bottom shelf is my large sewing machine and two sewing baskets. In addition, my embroidery floss and basket of zippers also found their way here. As you can tell, there's still room for a few more supplies. I just haven't made it that far yet. The Craftroom closet was also completed. It doesn't look like much of a change from what you saw last week, but for me. . .it's MAJOR! To aid me, I've got my handy dandy notebook with me. Seriously! These are the notes I leave to myself. Otherwise, I might just forget. With that in mind, I'm thinking about popping over to a few thrift stores this afternoon to look for some storage solutions. Wish me luck! 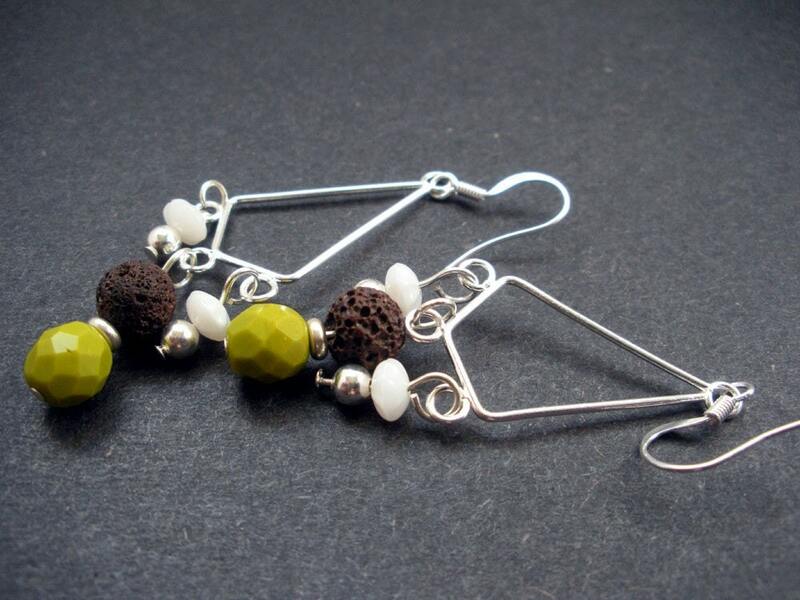 I know I haven't listed anything new in the shop in about a week, but I did place two pairs of earrings on sale this morning! 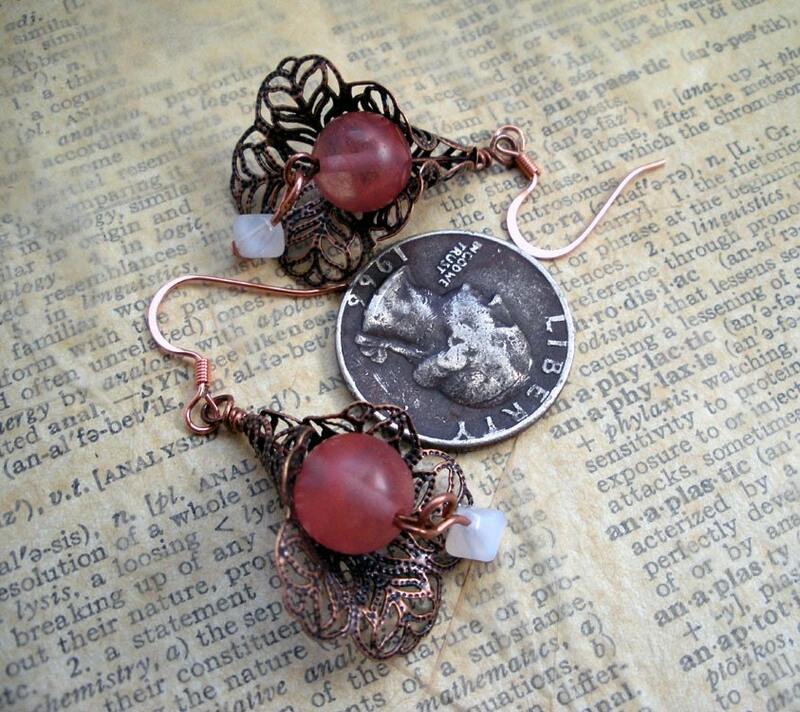 Copper Calla Lily Earrings - 15% Off! And now. . A big THANK YOU to all of you who visited yesterday for the Button Swap Blog Hop and left such encouraging comments. I really thought I was the only one who would like the Ent Wife necklace, but y'all really surprised me with all the support. Thank you. Finally, I've come to the end. Let me wish you a Happy Earth Day AND a most Blessed Easter! You have really enthused me. 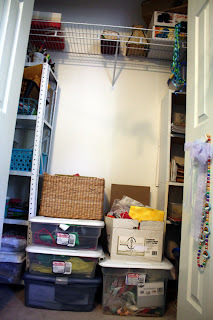 Now I feel like organizing my craft room which I'd love to call STUDIO- now a storage box room:(. 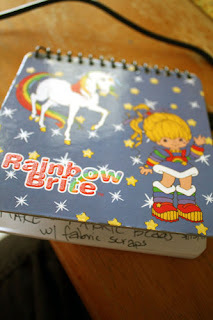 Your idea about the note book is some thing I'm going to steal. I love your button project too. Dita. Go for it. Of course, I've had to put creating on hold while I overhaul the mess, but I think it will be worth it in the end. As far as the notebook. I'm the queen of lists. I can't remember ANYTHING without one! Don't forget that if you want an entry into Michelle's giveaway, you'll need to leave a comment on my button project post! I think that's the only one she'll be looking at. If you've already left one, cool! Patty, I'm trying. . .I'm trying!! Hope, Thank you for visiting my blog and your kind words. Now I am a follower of you. Dita.